Every so often my girlfriends and I go out and have a few drinks together and play catch up, but lately with the holidays near and Winter fastly approaching, we've been staying in and hanging out together and that's just as much fun. Two things we love to do is drink wine and play games together, so when we had the opportunity to try ZinZig, a wine tasting trivia game, we jumped on it and were super excited. 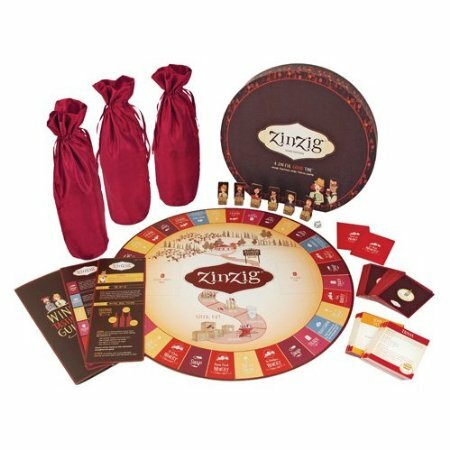 To play the game you do need between two to three bottles of wine depending on the number of players that are playing and if you have around six players, you can break off into teams, which is the part we liked best. There was six girls total, so breaking off into teams and helping each other out with the questions was a lot easier than being asked as an individual. The game is pretty easy to follow, the questions, not so much, but if you're a wine expert or know a bit about wine, the questions would seem easy as pie to you. We did seem to get a few questions correct, but not many since the group of us love wine, but aren't experts on it. It was truly a fun experience and we had a great time playing together and learning some things we didn't know before hand and of course, sipping on our wine. This game would be perfect for the up and coming holidays for a group of adults, definitely worth trying. I'll be bringing this trivia game with me for Christmas dinner to my mother in laws so we can all play together, which should be fun! Disclosure: All opinions are my own. I received Zinzig for the purpose of this review. No other compensation was received.